The Budge Rain Barrier station wagon cover offers easy to use, 100% waterproof indoor and outdoor protection. This station wagon car cover is constructed from a 3 layer material consisting of an inside and outside layer of spun-bond polypropylene. The middle layer is made from a waterproof film. Unlike most waterproof station wagon covers, the Budge Rain Barrier features micro-pore technology that allows condensation to escape as evaporated gas – giving your vehicle inside and outside protection. This cover is great for outdoor and indoor use. The soft, nonabrasive material will not harm the surface of your vehicle. This cover features a full elastic hem and built-in grommets. This cover is available in a gray or tan color. Includes a storage bag and antenna patch. The Budge Rain Barrier series of covers are made from a three-layer waterproof material, which consists of an inside and outside layer of spunbond polypropylene with a waterproof film layer in the center. This cover is 100% percent waterproof and proven to protect against the heaviest rains. The Rain Barrier does not trap condensation like most waterproof covers. 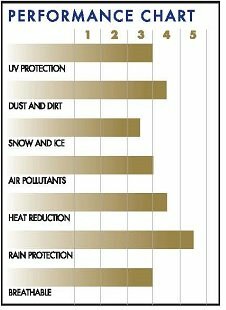 Instead, the Rain Barrier’s micro-porous technology allows condensation to escape as evaporated gas. This cover is suitable for outdoor and indoor use and Budge semi-custom sizing assures a snug and secure fit. A storage bag is included for when not protecting your vehicle. As the material of a Budge car cover is very lightweight and thin, it is exceptionally simple to store, in very little room, while being easy to handle. This is important when you have limited storage space such as in a trunk or garage storage container, or when you will be using the cover for a purpose other than simply storing the car over a season. 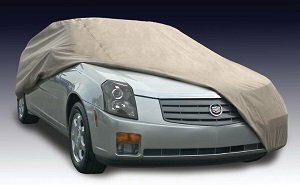 Being easy to manipulate and store makes Budge car covers ideal for applications when you expect to cover and uncover your car frequently. Due to its breathability and water resistance, Budge car covers will dry extremely quickly so that mold and mildew will not form. Equally, the cover also protects from tree sap, pollution, acid rain, and dust, among other things that you will not want on the surface of your car. This means that once you have put Budge car covers on your vehicles, you can simply walk away and know that they are safe from the many influences around them that could take away from their showroom-quality appearance.